"Gives children a fun and safe place to practice their balance and coordination skills. Hand-eye coordination improves as they use the handholds in the butterfly wings. Encourages children to socialize and negotiate to pass one another. Each colorful butterfly sold separately. This climber is part of the PlayTown line, which was designed by starting with Early Childhood Learning standards. The activities support and reinforce classroom learning in an outdoor environment, while encouraging imagination and cooperation. 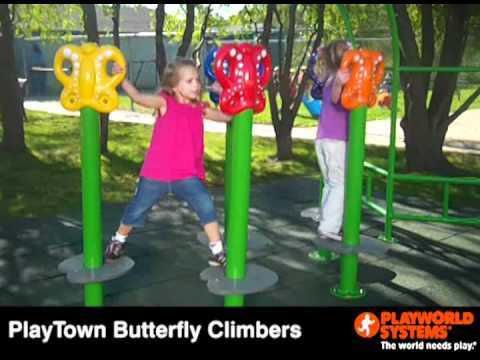 The Butterfly Climber is made of durable steel and aluminum, and it can be mounted on an appropriate surface or installed in-ground."